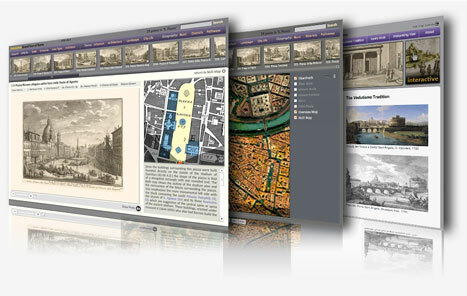 Giuseppe Vasi’s Grand Tour presents an innovative geo-database (geographic database) and website that references the work of two 18th century masters of Roman topography: Giambattista Nolli (1701-1756), who published the first accurate map of Rome (La Pianta Grande di Roma, 1748); and his contemporary Giuseppe Vasi (1710-1782), whose comprehensive documentation of the city and its monuments, especially in Delle Magnificenze di Roma antica e moderna, published from 1747-1761, establishes him as one of Rome’s great topographers. Both Nolli and Vasi excelled at describing Rome in geo-spatial terms, one through scientific measurements and the ichnographic plan, the other through careful observation within a pictorial tradition that relied on mathematical perspective. Vasi’s Grand Tour places the work of these two masters in their cultural context: 18th century Rome and the Age of the Grand Tour examining the cartographic and artistic legacy that they inherited. It gives an account of Nolli’s work in light of this context but especially focuses on the vedutismo tradition and its impact on the work of Vasi and his contribution to the vedute genre. Over two hundred and forty of Vasi’s topographic prints are presented in detail and in relationship to Nolli’s map. Vasi’s work and methods are subsequently interpreted through an analysis of their topographic, artistic, and historic content. Copyright © 2008 University of Oregon. All rights reserved. This website was made possible by a 2006-2007 grant from The Getty Foundation.